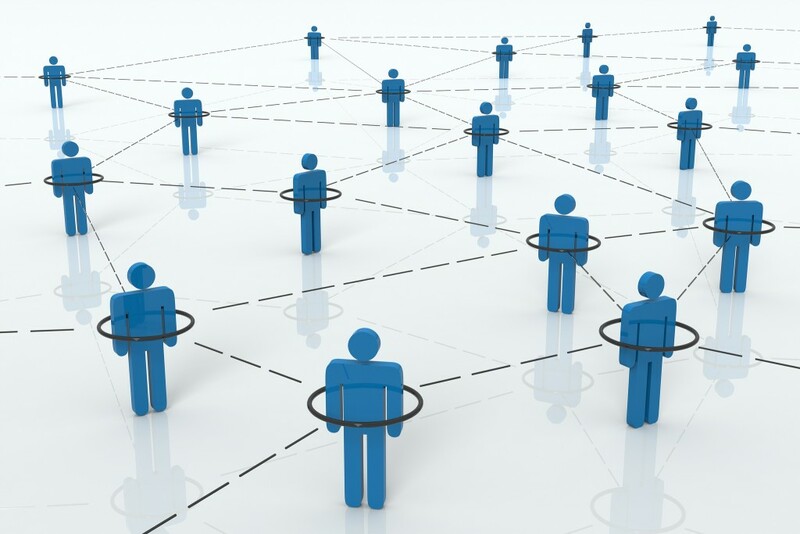 “3D Social Networking” by Chris Potter is licensed under CC BY 2.0. This is the third in a series of posts on academic social networks. First launched in 2004, Google Scholar was created by former University of California, Santa Barbara Professor Anurag Acharya and engineer Alex Verstak. Although not a social network in the traditional sense, Google Scholar has become an important tool for finding and keeping up with the latest research, promoting one’s own work, and tracking scholarly impact. While Google does not release usage statistics, in a recent Springer Nature survey, 89% of respondents said they use Google Scholar in a professional capacity. The social part of Google Scholar is pretty basic: you can “follow” researchers so that when they have a new article or citation you will get an email from Google. You can also set up alerts based on your own research interests. This can be useful when you want to know about the latest work being published in your field. Many researchers use Google Scholar to help establish their scholarly credentials. Creating a Google Scholar Profile can help you raise your visibility as a scholar and make sure you’re getting credit for all of your publications. It’s easy to do, although it does take time to maintain. From the Google Scholar landing page, click on “My Citations.” Then simply fill out your name, affiliation, areas of interest, and provide a link to your personal or departmental website. [Note: You might want to sign up using your personal Gmail account, rather than your Temple.edu account, because if you leave Temple, you will lose access to your Google Scholar account.] Based on this information, Google will then show you a list of publications it thinks were written by you. If you have a common name, you’re likely to get a lot of publications you’ll need to weed through. That having been said, Google often doesn’t find everything, especially in the humanities. So, if some of your publications are missing, know that you can always add them yourself manually. Going forward, you can choose to have Google automatically update your profile with new publications or you can have them send you an email first to get your approval. We recommend that you approve them first, as Google Scholar data is notoriously messy. However, if you do decide to let Google update them for you, check your profile regularly to make sure that Google hasn’t claimed a number of publications which aren’t yours. Once you’ve setup your profile, you can also add a photograph, verify your Temple affiliation, and add coauthors. Also make sure to set your profile to public! Based on your publication data, Google will compile your total number of citations, your h-index score, and your i10-index score. These numbers are public and will be displayed unless you set your profile to private. You may not have heard of the i10-index. That’s because only Google Scholar uses it. It’s the number of publications with at least 10 citations. Another thing to note: Any articles you add manually will be included in your total number of citations, but not in your h-index score or your i10-index score. While it can be tempting to take these metrics at face value it’s important not to. Google Scholar’s citation analysis is done by a computer, not a human. There is very little quality control. 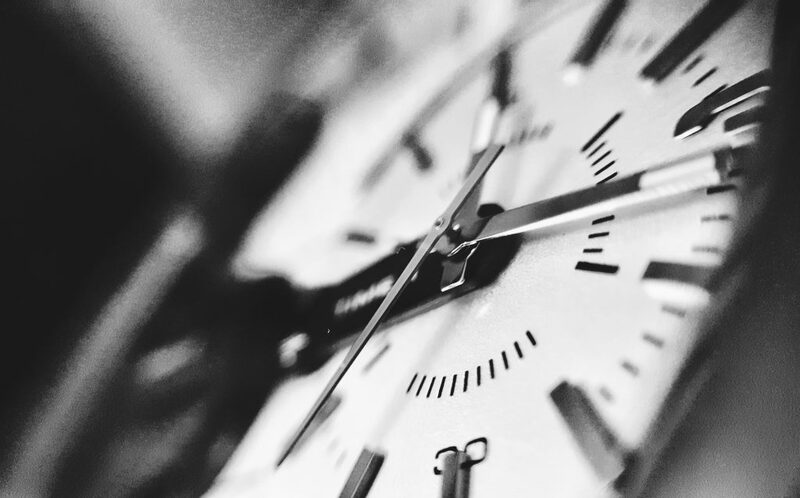 Especially if you are coming up for tenure it is more than worth it to take the time to compare your Google Scholar metrics to what you can find in Web of Science and Scopus. We also recommend doing your own research on your scholarly impact. Do you use Google Scholar? What do you like or dislike about it? Last year on the blog, we introduced ORCID, a non-profit organization that provides persistent, unique identifiers to researchers across the globe. ORCID iDs help ensure that researchers get credit for all their scholarly contributions. While there are a number of different researcher identifiers out there (including ResearchID and Scopus Author ID), we recommend that all Temple researchers register for an ORCID iD. It’s free and it takes less than a minute to sign up. There are currently 3,364,764 live ORCID iDs. Sixteen publishers, including the American Chemical Society, PLOS, and Wiley, now require that authors submit ORCID iDs at some point in the publication process. And if you think ORCID is just for scientists, you’re wrong. Cambridge University Press has begun integrating ORCID iDs into their book publishing workflows, and Taylor & Francis is currently undertaking a pilot project to integrate ORCID iDs into their humanities journals. Researchers can use their ORCID iD profile to highlight their education, employment, publications, and grants. They can even add peer review activities. The American Geophysical Union, F1000, and IEEE are just three of the organizations that currently connect with ORCID to recognize the work of their peer reviewers. In order to get a better sense of who is using ORCID at Temple, we looked for researchers with publicly available ORCID profiles who note “Temple University” as their current place of employment. We found 205 ORCID iDs that matched this criteria. Of those, the Lewis Katz School of Medicine has the highest number of researchers with ORCID iDs at Temple. The College of Science and Technology has the second highest number, with faculty from Physics, Chemistry, and Biology being well particularly well represented. The College of Liberal Arts has the third-highest number of ORCID iDs, thanks in large part to the Psychology department. A handful of researchers in the Fox School of Business, the College of Engineering, and the College of Education have also signed up for ORCID iDs. The overwhelming majority of researchers with ORCID iDs at Temple are faculty members. Some postdoctoral fellows have ORCID iDs, but very few graduate students do. Because filling out one’s ORCID iD profile is optional, and profiles can also be set to private, our data is incomplete, and probably underestimates the true number of individuals at Temple with ORCID iDs. 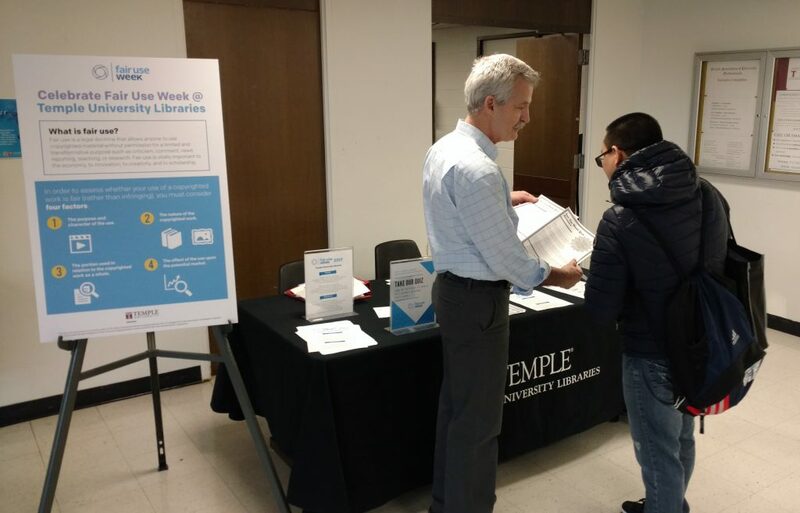 Nonetheless, it is exciting to see that researchers in almost all of Temple’s schools and colleges have signed up for ORCID iDs. We’re confident that this number will continue to grow in the future. Temple Libraries is proud to be an institutional member of ORCID. Librarian Greg McKinney talks to a student about fair use during Fair Use Week. Photo courtesy of Steven Bell. Last week was Fair Use Week, a five-day celebration of the fair use doctrine. 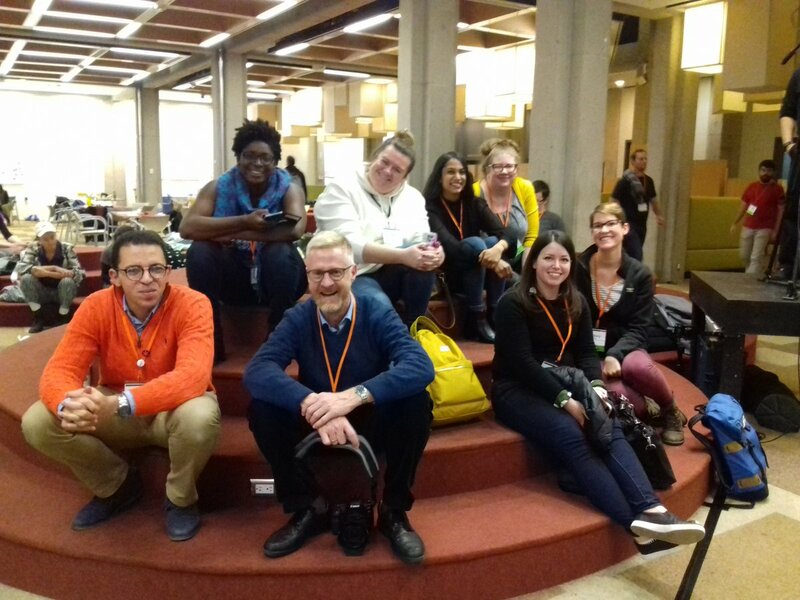 Libraries across the United States and Canada held events to raise awareness about the important role fair use plays in the lives in students and scholars. Here at Temple, we organized several events. We kicked the week off with a fair use quiz. Students who passed by the first floor of Paley Library last Monday were asked to test their knowledge of fair use by looking at four well-known court cases and deciding whether or not the use in question was fair. All students who took the quiz were entered to win a $25 Barnes & Noble gift card. In the end, 47 students took the quiz. Overall, our students did an excellent job distinguishing between fair and infringing use. On Tuesday, we held an event for our library staff. We watched the ACRL webinar, “Using Fair Use to Preserve and Share Disappearing Government Information: A Guide for Rogue Librarians.” This webinar was particularly timely for us, as a number of our librarians are involved with the Data Refuge Project which was started at the University of Pennsylvania. Despite the webinar’s title, the librarians who are working to preserve government information are not “going rogue,” as this action clearly falls within the bounds of fair use. On Wednesday, Resident Librarian Anastasia Chui led a workshop on copyright and fair use for undergraduates. This Jeopardy-style workshop asked participants a series of questions about different fair use situations they might encounter. 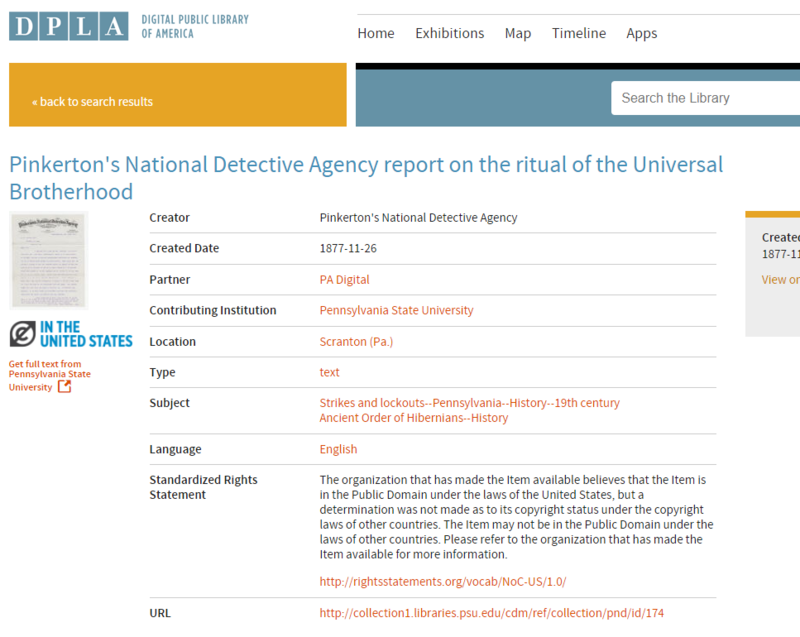 Finally, we interviewed Nikki Miller, Rights and Contracts Coordinator at Temple University Press, about “Fair Use from a Scholarly Publisher’s Perspective,” for this blog. It was a great week and we look forward to participating again next year. This is the second in a series of posts on academic social networks. Our first post was on Academia.edu. Based in Germany, ResearchGate is a platform that enables researchers to connect with others and share their work. The company was co-founded in 2008 by Ijad Madisch, a PhD in virology. 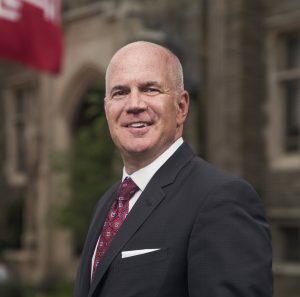 Madisch is also the current CEO. Since it started, ResearchGate has raised millions of dollars in venture capital money from a number of high profile firms and individuals, including Microsoft founder Bill Gates. Originally, only scientists were able to join ResearchGate. Now, anyone can sign up, but the platform caters to academic researchers, corporate researchers, and medical professionals. ResearchGate claims to have over 9 million users, although it is not known how many of those use the platform regularly. According to one recent survey, two thirds of respondents noted that they are active users of ResearchGate. Like its competitor Academia.edu, ResearchGate allows users to post full-text versions of their publications to their profile, or they can enable other scholars to contact them privately to get a copy. Users can even generate their own DOIs (digital objects identifiers) for work they post. The platform also hosts question and answer forums and a job board. One interesting feature of ResearchGate is its Open Review. Open Review lets users write a review of any publication on ResearchGate (whether the full text has been posted or not). Before signing up for ResearchGate, it’s important to know that some scholars have complained about how aggressive the company is when it comes to marketing. ResearchGate has been known to spam users and users’ co-authors. The company has also been accused of setting up fake profiles for scholars who never registered for an account, and posting articles without authors’ permission. As ResearchGate is a private company, many scholars have started wondering what the platform will do once its venture funding runs out. Madisch has said in the past that ResearchGate will not sell researcher’s data. According to a recent article in Times Higher Education, Madisch believes that the company will be able to become profitable through advertising alone. Whether this is true or not remains to be seen. UPDATE: The Manifold platform has now launched. Vega is a digital publishing platform being developed under the direction of West Virginia University for books, journals, projects, data sets, and other scholarly output. The Vega team is particularly interested in streamlining the production and editorial process for publishers. Unlike some existing platforms (such as Open Journal Systems), Vega will be completely customizable. Look for it to launch in 2018. Editoria is a digital-first book production platform being developed by the California Digital Library, the University of California Press and the Collaborative Knowledge Foundation. Like Vega, it is designed to simplify the publishing workflow process in order to help lower production costs. A beta version of Editoria is planned for release in late 2016/early 2017. Fulcrum is a digital publishing platform being developed by the University of Michigan Library and Press. Fulcrum will make it easier for authors who want to link their source material to their scholarship. The resulting digital piece can be published as a supplement to a print book, or can even take the place of a print book. One of Fulcrum’s early adopters will be Lever Press, a new press run by a group of leading liberal arts colleges that plans to publish open access, digitally native scholarly monographs. Manifold Scholarship is a digital book production platform being developed by the University of Minnesota Press and the GC Digital Scholarship Lab at the Graduate Center of the City University of New York. Similar to Scalar, Manifold aims to help authors create media-rich scholarship that is nonlinear and allows for reader feedback. Although the Manifold platform is not yet live, the University of Minnesota Press has begun considering potential book projects. This is the first in a series of posts on academic social networks. Academia.edu is a platform for sharing, reading, and discussing scholarly work. The company was founded in 2008 by Richard Price, a philosophy DPhil who left the academy to become an entrepreneur. Despite its confusing URL, Academia.edu is a commercial company. Thus far, they have raised an impressive 17.7 million dollars in venture funding. The site is completely free to join and use. While the company makes some money from selling ads, they are still looking for a sustainable business model. To date, over 36 million academics from around the world have registered an account on Academia.edu. While this number is impressive, it is hard to know how many of those who registered actively use the site. Researchers join Academia.edu for a number of different reasons. The platform helps scholars reach larger audiences. Scholars can upload articles, dissertations, conference papers, as well as a variety of other published and unpublished work to the platform. Anyone, regardless of their university affiliation (or lack thereof), can access what is posted. 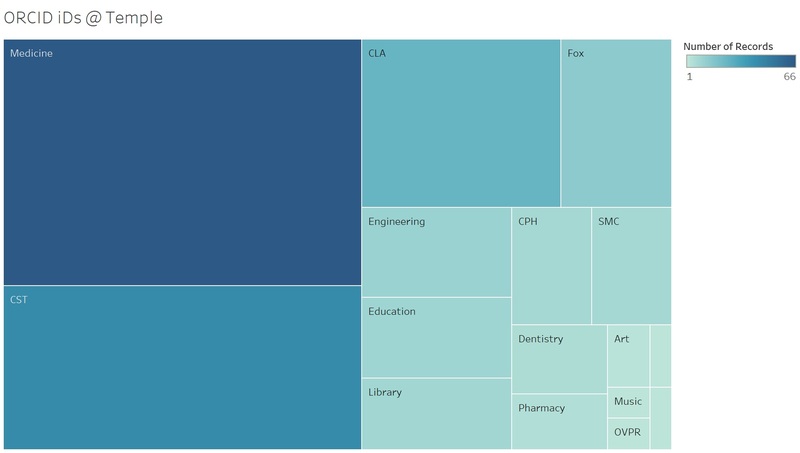 Academia.edu then provides researchers with metrics on who is reading their scholarship. In addition, the site makes it easy to keep up with others who are writing on similar topics (alerting the user when a new article related to one’s research interests is posted). Some people even use the platform as a home for their scholarly profile. Researchers can add their CV and link to various social media accounts. The company is also experimenting with a number of additional features, such as something they call “Sessions,” in which a group of users gets together in a chat room to peer review a paper. The event is private and only those participating can see comments from other users. The idea is that through “Sessions,” academics can get useful feedback on their work from dozens of peers, similar to what they might experience at an academic conference. While there are many reasons to join Academia.edu, there are also reasons to proceed with caution. First, researchers who post copies of work in which they do not own the copyright run the risk of getting in trouble with publishers. In 2013, Elsevier sent take-down requests to thousands of Academia.edu users who had illegally shared copies of their scholarship. These take-down requests eventually stopped, although it is not clear why. Some say Elsevier did not want to anger academics (who the company relies on to write articles and provide peer review). However, it is important to note that individual journals (such as the William and Mary Quarterly), continue to send take-down notices to users. We recommend that all Temple users of Academia.edu check their publication agreements before posting work to the site. Second, there are a lot of unanswered questions about what changes the company will have to make in order to turn a profit and satisfy investors. Recently, University of Oklahoma Professor Scott F. Johnson got an e-mail from an Academia.edu staff member asking if he would be willing to pay a fee to have his work recommended by an Academia.edu board of editors. Although the idea was not actually implemented by Academia.edu, it got academics thinking about how the company is trying to monetize scholarly work. A number of prominent scholars, including Kathleen Fitzpatrick from the Modern Language Association and Martin Paul Eve at the University of London, have called for scholars to delete their accounts or at least use multiple platforms. There is even a #DeleteAcademiaEdu hashtag. One final point to remember about Academia.edu is that it is not a good means of preserving scholarly work. We have no idea if the company will even exist five, ten, or twenty years from now. So, researchers who are concerned with the long-term preservation of their scholarship should also make sure to deposit their work in a trusted, discipline-specific repository, such as ArXiv, which is funded by Cornell University, the Simons Foundation, and various member institutions (including Temple University Libraries). Do you use Academia.edu? What do you like or dislike about it?